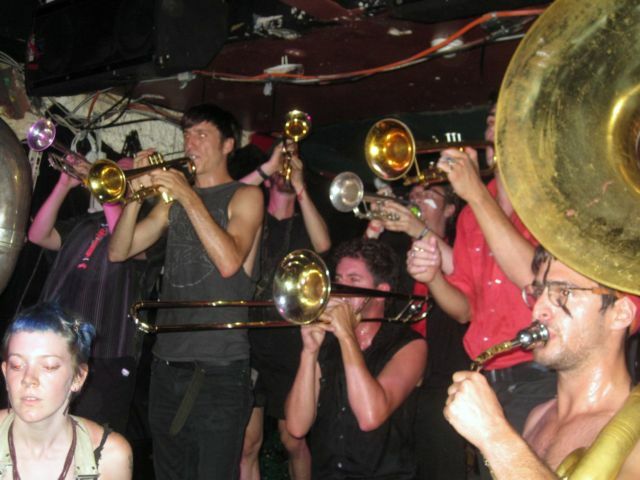 Toronto – 19 piece brass punk band. Those were the only words I needed to sell me on going to Rancho Relaxo Tuesday night to see Rhode Island band What Cheer? Brigade perform. I expected a hot sweaty mess filled with chaos and sound and that’s what was delivered. With a host of instruments ranging from tubas to horns to trombones, the band played a host of songs to the rambunctious crowd who were more than eager to dance. There were also a few members armed with marching drums to pace the night along. While I don’t know any of the tracks that were played, me and Paul swore that we could hear random samples of some famous songs in the mix, only we can’t pick out which ones. For the two song encore, the group gathered the masses and led them onto the streets for a rousing finale that no doubt energized the crowd and annoyed all the neighbors. An unexpectedly great time, check them out if they are in your town.